Economic and financial analysis of batteries and storage is introduced on this webpage. 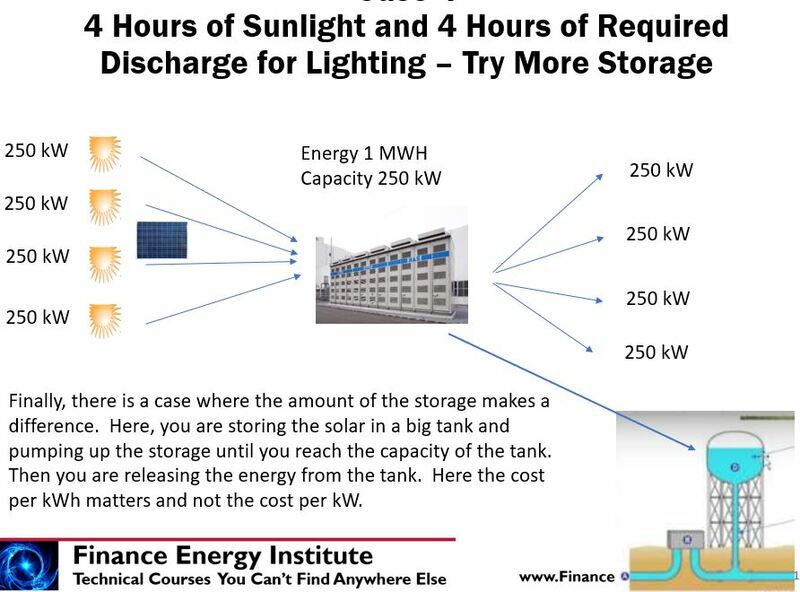 Storage and battery analysis adds complexity to electricity analysis because the value of discharging batteries less the cost of charging batteries must be considered over time. In addition battery analysis should consider the value of servicing sudden and foreseen changes in demand (balancing costs and ancillary services). Finally the potentially high degradation rates of batteries and the relatively short life of batteries must be considered in evaluating the fixed cost of batteries. The values created by storage depend on the manner in which demand occurs over time and optimal capacity and storage of batteries should be considered in an analysis. 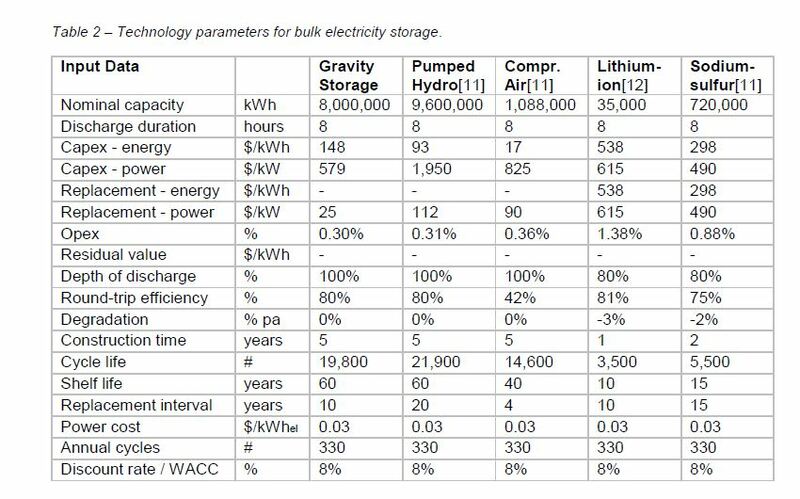 In assessing the value of storage and batteries I have used a study by Lazard as the basis for an analysis. This study which has now been published in a few versions derives something that the bank calls the levelised cost of storage. I will explain why I think the concept is B.S. and meaningless. The Lazard study presents a number of fancy football field graphs and then provides data on the capital cost per kWh, efficiency and operation cost per kWh of different types of storage options. What I think is necessary is a step-by-step analysis that demonstrates the costs and benefits of battery operations. The notion of using kWh instead of kW as the basis for cost can easily create confusion at first as the cost depends on the amount of storage in a battery per cycle (like the hours of storage on your phone or laptop). Rather than presenting a bunch of fancy graphs I attempt to walk you through storage analysis using carrying charge rates and spreadsheets that tabulate charging and discharging of batteries in different situations. I have put together examples of when to use kW or kWh in analysis of batteries in the slides below. A couple of extreme pictures from the power point slides illustrate the problem. 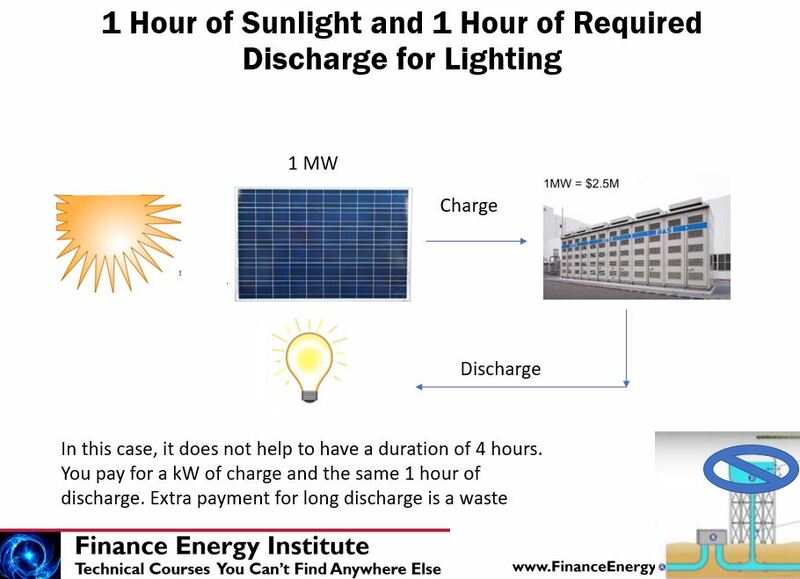 In the first case illustrated in the screenshot below, an extreme situation where there is only one hour of solar power during the day is assumed. Here, there is no need for storage that exceeds the capacity of the battery because all of the battery capacity (kW) must be used in the one hour to put energy into the battery. Paying for multiple hours of storage over (kWh) above the capacity of the battery would be a complete waste of money. Here you should only look at cost per kW and not cost per kWh. In a second case, there are many hours of solar power which can be “pushed” into the battery and there are many hours of required load that do not occur until after the sun has come down. In this second case, the amount of storage over and above capacity makes a big difference and it is the cost per kW – hour of storage that matters. This case is illustrated on the diagram below. In this diagram a battery that could store four times as much capacity and have 1,000 kWh of storage would be much more valuable than a battery that had only 250 kW of storage. Currently, there is a lot of BS surrounding discussion of the value of batteries ranging from the Paypal ripoff man (Elon Musk) to suggesting that the levelised value of storage means anything at all. Another B.S. is shown in a publication by Imperial College on the confusing notion of the levelised cost of storage. In this file, the cost per kWh and the cost per kW of the Lithium-ion battery is about the same even though there is 8 hour of discharge. As with other cases of energy and finance problems my hope is that you can use information to calculate values yourself and do not rely on either confusing graphs of meaningless statistics nor statements from famous people. To to this for batteries I suggest that you first make a few fundamental cost and benefit calculations and then try to simulate the value of batteries in the context of an island (if you are fancy you can call this a microgrid) where the only choices for energy generation are solar and diesel. This is and and a retail rate analysis is presented on later pages of the website. To establish such a micro-grid simulation I include discussion of how to collect real world data on items including the cost of batteries and other storage; the cost of operating diesel power plants; the potential future price of diesel fuel; and the economics of solar power with batteries in a micro-grid. I demonstrate how you can make your own analysis of batteries and storage and how the analysis of batteries and storage depend on load shapes and the value of power during different time periods. You can download files with the analysis by clicking on the two buttons below. In addition to evaluating the value of batteries in a micro-grid and retail situation, I present the value of storage and ancillary services using merchant prices in later webpages. Ultimately, the value of batteries in merchant markets depend on analogous issues to the factors that drive the mirco-grid analysis. This is loads during different times that converts to differences between on-peak and off-peak prices as well as the fuel costs that are behind the variation between on-peak and off-peak prices. A dispatchable plant (e.g. a peaking plant) has some measure of capacity that measures the output of the plant in any instant. The input to the plant in any instant (measured in MMBTU or Kcal or Giga Joules or even kWh) is also delivered at a single point in time. There are generally no constraints on the storage of inputs that limit a dispatchable plant from operating. For a battery, the output can only be delivered over time, if that the battery has storage. This issue of storage makes batteries not comparable to dispatchable plants such as peaking plants. For example, if the battery has a capacity output that can produce 1 kW, that 1 kW may be produced for 8 hours producing an output of 8 kWh. Alternatively it may have less storage and produce power only for one hour producing 1 kWh. The amount of output from the battery contrasts with the amount of electricity that is used to “push power” into storage. This amount of power at any instant is like the amount of energy that is delivered to an electricity plant and can be measured with standard units of capacity such as kW. Some people have explained to me that batteries are like a water tower that stores and releases water. The amount of water that is pushed up is measured in kW at any instant. It takes time to charge the battery. The discharge of stored energy also has a time element. This makes measurement and benchmarking of the cost of a battery somewhat more complicated than for a typical electricity plant. For example, one would not express the cost per capacity of a peaking plant as the cost per delivering five hours of electricity. One expresses the number as the Euro or USD relative to the amount of capacity — in kW — that can be delivered at an instant. For batteries, the standard is to measure the cost of the battery relative to the kWh discharge. If we are on an island and we need power at night, we can pay for it with a diesel plant that is benchmarked on a per kW basis. If we want to use a battery instead (which is very difficult) we would have to pay for many batteries with no storage or a lot more for a battery with storage. Without arguing about whether this idea of using kWh instead of kW is a good or a bad benchmark, we should understand that the benchmark is different for a battery than for a standard plant. Further, the output may be able to be produced very quickly for frequency regulation, spinning reserve or voltage regulation (discussed below). I have tried to explain these things a bit in the video below. One of the pages below works through the benefits batteries provide in terms of ancillary services. There are many ancillary services, meaning things that a power plant or a battery can provide other than providing energy that turns on the lights. People like to make this very complicated and seem to suggest that these services that do not turn on any lights are more valuable than the energy itself. Some of these services are called frequency support, regulation support, black start capability, and what I think is the most important which is spinning reserve. Many of these problems arise from variation in loads or renewable energy.